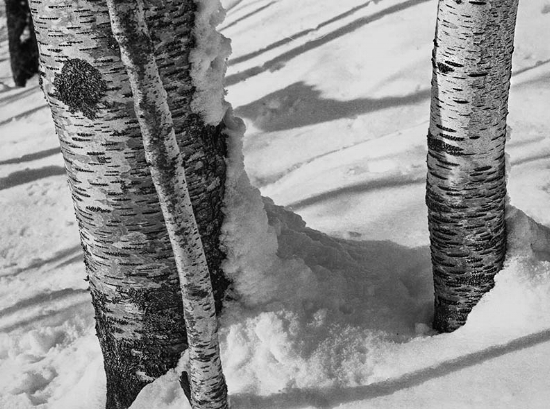 The forest in which the Wolverine Nordic Ski and Snowshoe trails are tucked is mature, and primarily maple and birch. During my three hour snowshoe hike on Sunday morning, the trees and cliffs were my only concentration. The cross country skiers were out and everyone seemed to be enjoying the warm up into the 20’s, which made outdoor endeavors much more palatable. The farmhouse smells good, as I am baking some low carb (keto) buns with almond flour. Benny, the consummate food beggar is familiar enough with the smell that he has positioned himself between my computer desk and a view of the oven. I am waiting for a roll of Kodak Portra 160 to dry, which I developed earlier in the evening. After decades of exclusive black and white film work, I am surprised at my affection toward this film. I suspect it is because the colors are so subtle, and not the in your face saturation of E6 slide films like Fuji Velvia 50. In fact, Portra, as the name implies, was designed by Kodak for pleasing and realistic portraits. In landscape and architectural work, when you desaturate it just a notch above monochrome, the effect is quite striking. Almost an ethereal antique look. And I guess if one looks at my farmhouse, furniture, and subjects for many of my images, antique is a word that well describes my preferences.